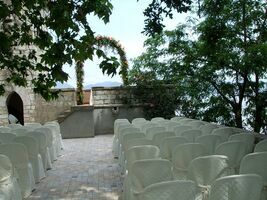 Special Feature: a civil ceremony can be performed at the villa, on top of the boathouse, overlooking the lake. Perched overlooking Lake Massaciuccoli and immersed in the greenery of a natural wildlife reserve park, this Neo-Gothic style villa is a one of a kind wonder here in Northern Tuscany. It is the only villa with a lake view in the entire region. 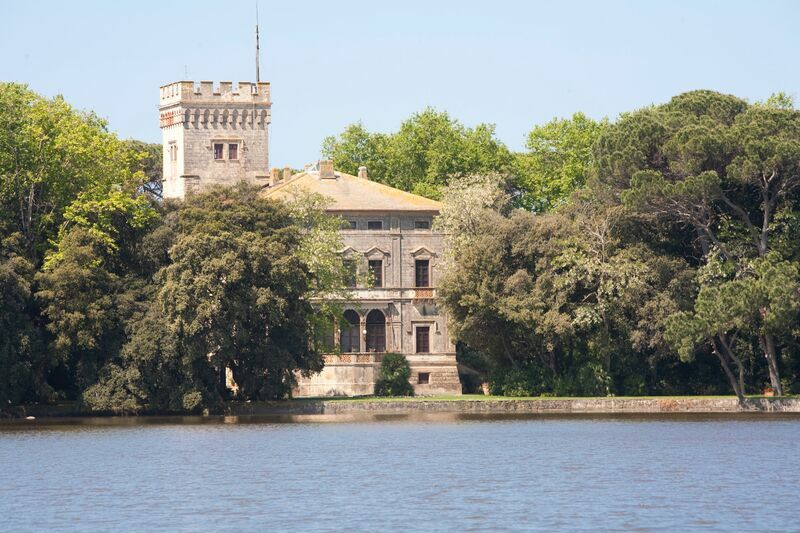 Originally constructed in 1869 to serve as a hunting lodge, in addition to the immaculately maintained villa, there is a tower that faces the lake and affords marvelous views of the lake, Apuane Alps, Apennines, and on a clear day, even the Tower of Pisa. Adjacent to the tower is a boat house that boasts a large belvedere roof deck, with yet another extraordinary view. For those that would like to make a grand entrance, the boat house provides a small boat and gondolier upon request. 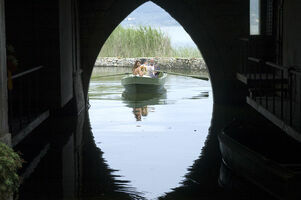 The couple can depart from the main villa by boat and glide across the lake to the boat house together. It is also possible to substitute the bride's traditional walk down the aisle with her father, with this poetic entrance of father and daughter in its place. 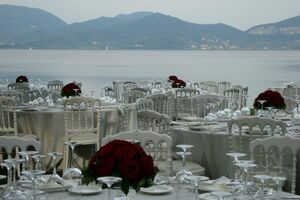 As a result, many people choose to hold their ceremony on the scenic roof deck of the boat house, and then adjourn to the lakeside front lawn for a cocktail hour under the shade of large pine trees. 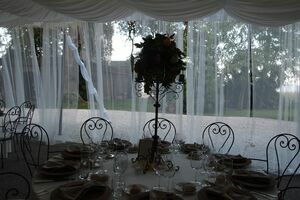 Dinner is taken under a large outdoor gazebo style tent that also faces the lake. 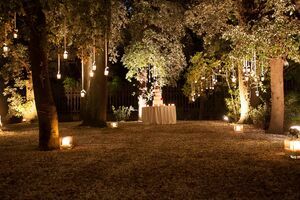 When you can eat no more, and have danced the last dance, you can invite your guests to join you inside the main villa, for coffee, after dinner drinks,and perhaps a light Tuscan confection. The interior of the villa is splendidly decorated with original artwork, sculpture, and pristinely maintained wall and ceiling frescoes. Finish the evening off in the drawing room, with its romantic balcony overlooking the lake, while listening to operatic ballads played on the same piano that Giaccomo Puccini once used to play. Conveniently located just 20 minutes away from the Medieval town of Lucca, this unique villa is not to be missed! One can choose to rent solely the grounds of the villa which include the boat house, tower, front lawn and gazebo. Or rent both the grounds and the main villa. For those that opt to rent the main villa, a private dressing room and bathroom is provided for the bridal party to change in. An ample tree lined parking area for your guests completes the villa's grounds. Hint to the bride and groom: think about choosing a wedding date that coincides with the full moon. Seen from over the lake, the effect is spectacular.